Rode Trip has been receiving Brian’s undivided attention lately. While I’m daydreaming about sunshine, crystal clear water, and swaying palm trees Brian is busy scrambling about Rode Trip tending to every need; completing projects that entail both repairs and improvements while supplies are still readily available. Every now and again I’m called upon to provide encouragement or act as gopher or cleaner-upper. (Seriously, we do collaborate on each and every project from beginning to end but Brian is the workhorse that keeps our boat afloat.) Brian and Rode Trip are simply inseparable! It seems, however, that this extra tender loving care from her owner/captain is just not enough for the ‘ol girl. Now Rode Trip has four new guys aboard! And let me tell you, these guys will really get her moving! Let me explain how the relationship with these four guys became a reality. As our cruising plans evolved, and our conversations with experienced sailors expanded, it became obvious that Rode Trip’s sailing rig needed an upgrade in order to improve downwind sailing. One spinnaker pole would be an improvement, but a twin pole rig would make her fully capable of crossing oceans with ease. But how do we install twin poles? To design a twin pole rig for Rode Trip, Brian consulted the experts (in this case fellow OCC’ers with tens of thousands of miles of offshore cruising experience). We’d like to thank Scott Kuhner for sharing his twin pole design with us; thus making this project possible. Scott not only gave us a demonstration of his twin pole rig aboard s/v Tamure, but he also shared his detailed article as a reference. Scott’s article explains it best – you can read it here. 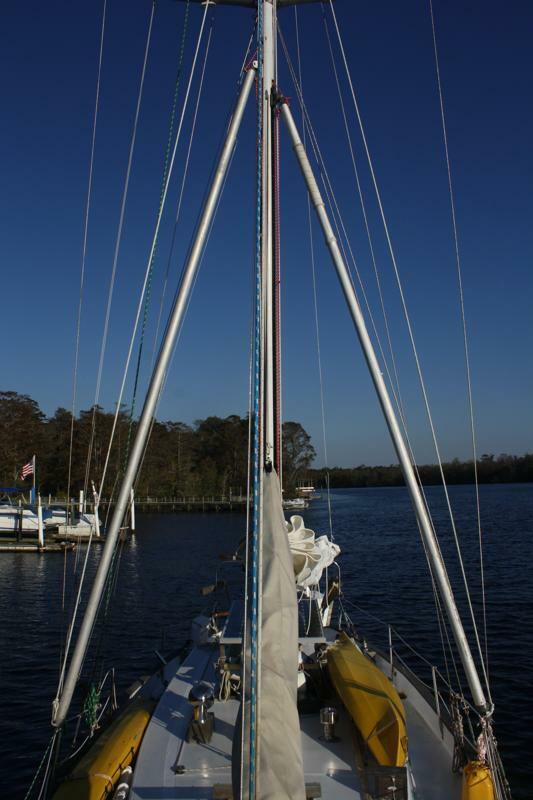 Two aluminum spinnaker poles; ideally these should both be the length of the boat’s J-dimension. Rode Trip requires an 18-ft pole at least 3-inches in diameter. 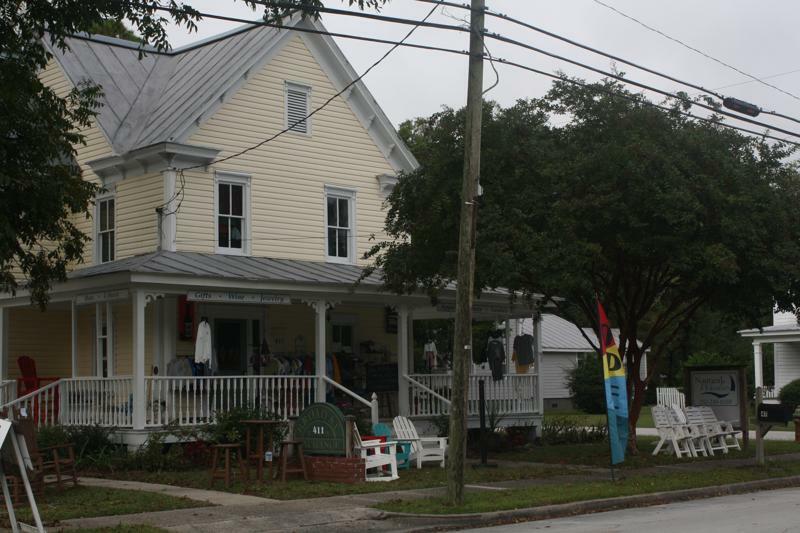 At consignment (Hurricane Jack’s in New Bern, NC is our new favorite shop) we acquired one 18-ft pole and one 16-ft pole. The outboard end of each pole has a jaw type fitting, the inboard end of each pole has a vertical eye fitting. Two aluminum tracks; at consignment we acquired one 14-ft length of track. We purchased a second 12-ft length of track new at West Marine. Of course, all the installment pieces were also necessary for the tracks; drill, tap, screws, teflon lubricant, and a good ‘ol bosun’s chair with a capable line handler. Two track cars; these were both acquired at consignment and both required a bit of customizing in order to adapt to the pole ends. The cars should enable the poles to pivot both up and down and side to side; Scott describes this connection as a ‘universal joint’. The cars do not require a stopper, in fact a stopper knot will be incorporated into the haul line for each pole. Pertaining to the track and car positioning on the mast, the track should be forward enough on the mast that when the cars pivot side to side they enable the poles to face directly forward. Lines and cleats; here is where we meet those four new guys. After rifling through our own lines we had about half of what we needed. Two topping-lift lines; installed on the outboard end of each pole and run through a block on the mast above the top of the track. Two haul lines; installed on the inboard end of each pole and run through a block on the mast at the top of the track down to a cleat on the mast at the bottom of the track. 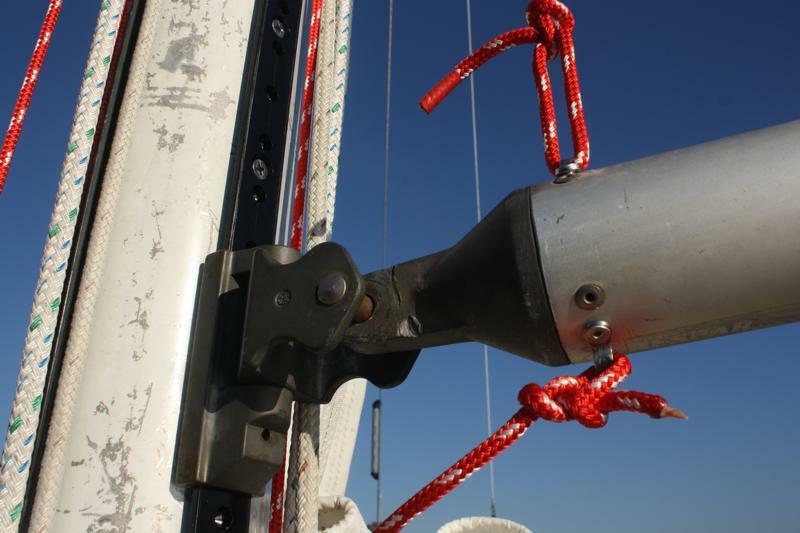 The haul lines have a very important stopper knot through the cleat to prevent the pole from dropping lower than the clew of the jib when in use. Two cleats we had were installed on the mast, one at the bottom of each track. To complete the line set up, we bought new lines for the fore-guys and aft-guys; these are lines that will enable us to maneuver the poles. 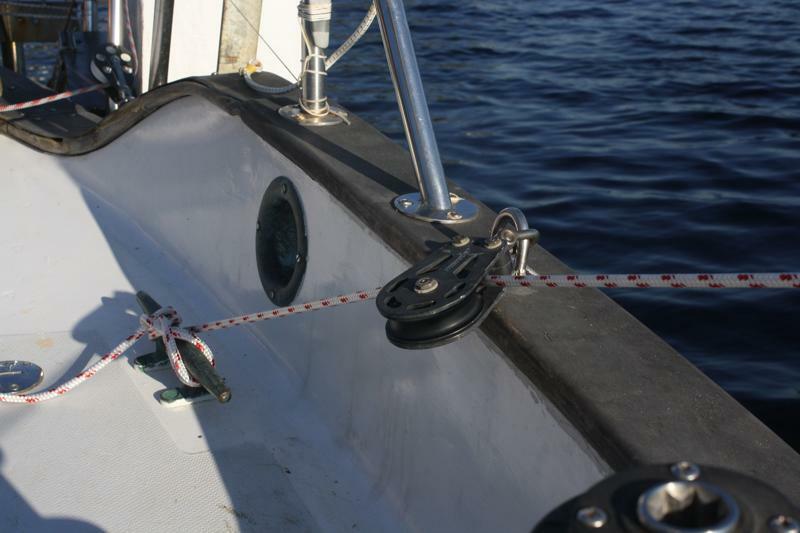 The fore-guy is installed on the outboard end of each pole, runs forward through a block on deck and back to a cleat (or tie-off in our case at the sampson post though a cam-cleat would be ideal here). The aft-guy is installed on the outboard end of each pole, runs aft through a block on deck and back to a cleat. Blocks; Brian had previously installed two blocks aft which were intended for spinnaker sheets and will now be used for the aft-guys. 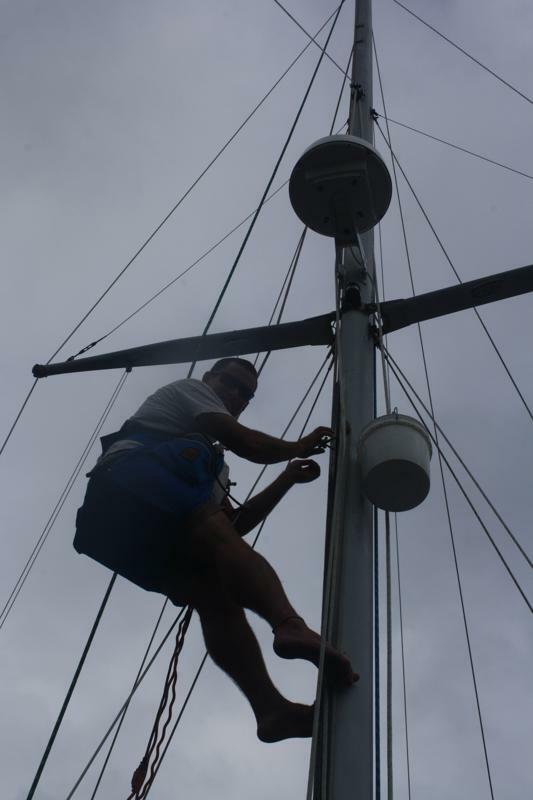 On the fore deck, Brian installed two blocks extending from the bowsprit that will be used for the fore-guys. On the mast, a triple-block was installed atop at center of the two tracks. 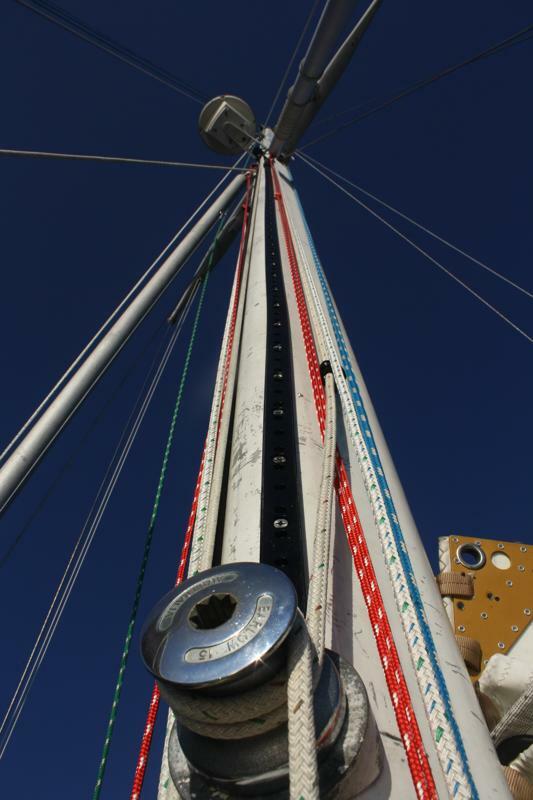 The topping-lift for each pole runs through this triple-block as well as the topping-lift for the staysail boom. The haul lines for each pole run through a block at the top of each track. Honestly, I’m not certain which blocks we had and which were found in consignment shops but getting them all was a mix-match between these and those. The poles are easily stored along the lifelines and out of the way. We can’t wait to let these poles loose in a good breeze! Oriental is ‘The Sailing Capital of North Carolina’. 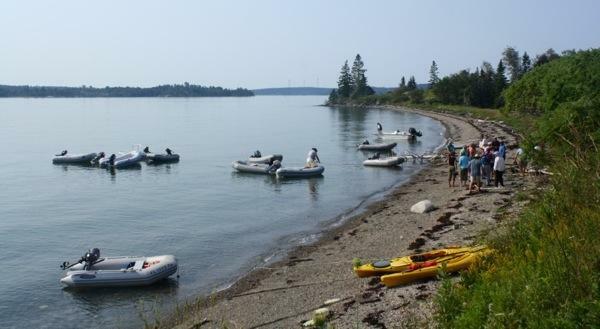 The approximate 2,500 sailboats outnumber the approximate 800 residents. 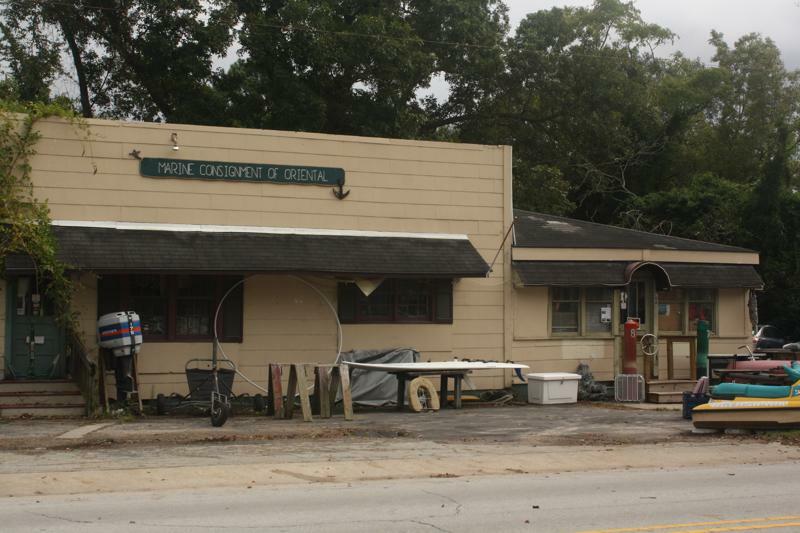 This friendly, small town is a convenient stop along the Intracoastal Waterway. I caution you to mind the hatchlings if passing through during autumn. 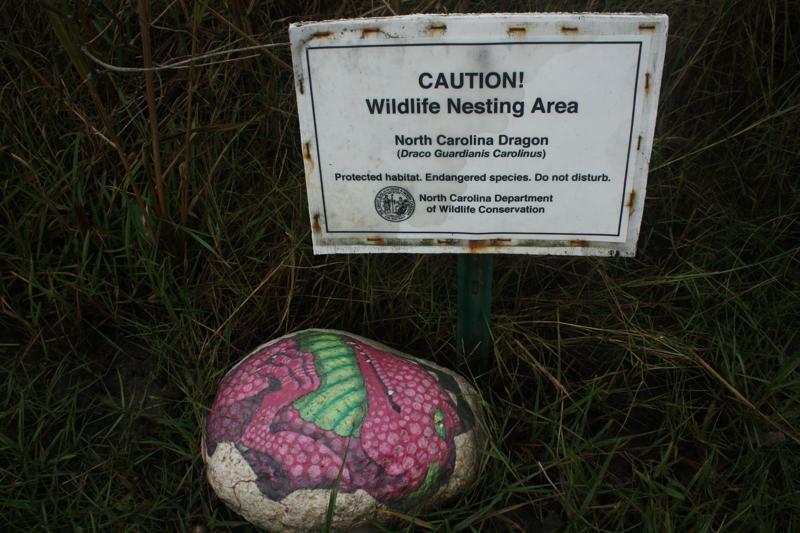 Oriental is home to an endangered species, the North Carolina Dragon (Draco Guardianis Carolinus). Brian and I had planned to stop in Oriental for two reasons: to connect with Ocean Cruising Club (OCC) Port Officers and to browse Oriental Marine Consignment. One of the numerous benefits of our OCC membership is the vast network of land-based members throughout the world. These Port Officers welcome fellow OCC’ers into their hometowns. They bring the OCC family together offering friendship and knowledge to incoming cruisers so that incoming cruisers feel right at home even though we are in a new place. Port Officers are only a phone call or email away. Don’t let the land-based addresses fool you. These Port Officers have endured and/or enjoyed thousands of miles of sailing and explored numerous places. 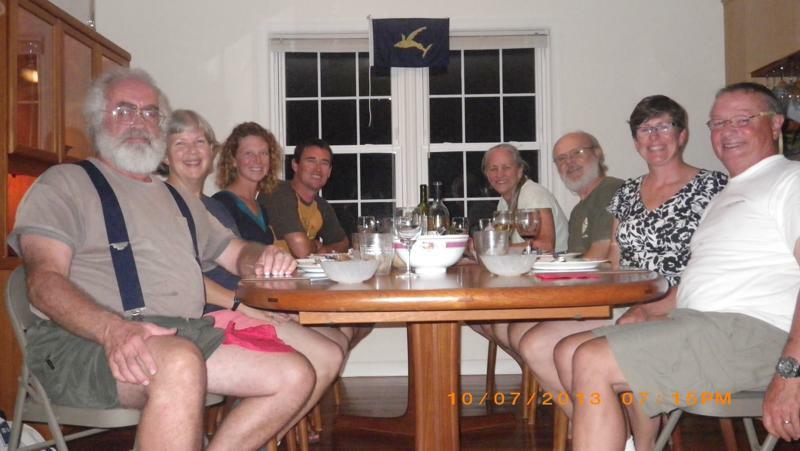 The Port Officers at Oriental are D and Don (s/v Southern Cross). D welcomed us at the docks and straight away found a safe slip for Rode Trip. We were docked within minutes and D was ready with a town map in hand and asking if we needed anything. D and Don also welcomed us into their home for dinner and a fiesty game of dominoes among friends. They gave gave us a thorough tour of s/v Southern Cross. We can’t thank them enough for their hospitality! 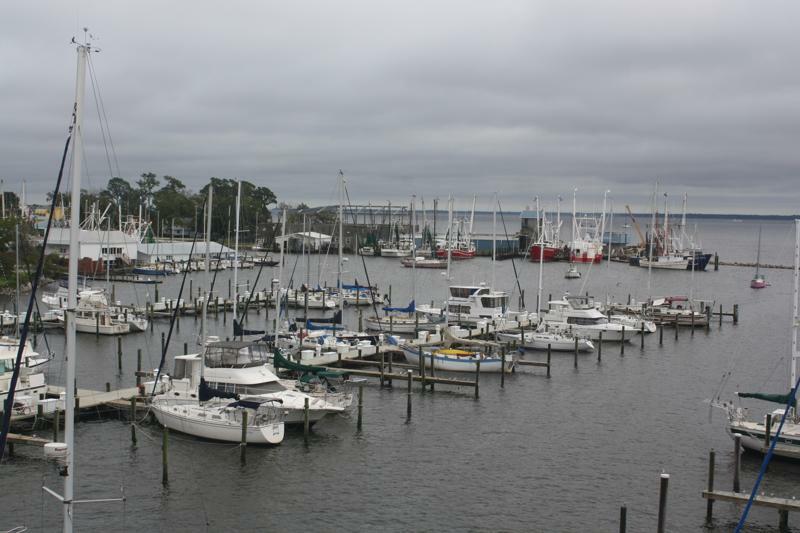 Can you spot Rode Trip at Oriental Harbor Marina? Brian and I spent hours, day after day, sifting through the odds and ends at Oriental Marine Consignment. The staff here are helpful and willing to bargain. We even picked through the two sheds out back. Brian has been devising a spinnaker pole set-up for Rode Trip and it just so happened that we were in luck at the consignment shop. We found a pole that was just right length wise, width wise, and had a good trigger style end fitting. We also found two blocks, among other goodies. We added a visit to the hardware store for two shackles. This project is getting pieced together…Brian will explain it all to you in due time. It was rainy, chilly, and downright awful weather! But we didn’t let the dreary days keep us cooped up while we waited for a brighter weather window to make our next move. We toured around town, browsing gift shops and chatting with locals. I’d recommend a stop at Nautical Wheelers for great gift-shopping and a taste of the most delicious caramels. 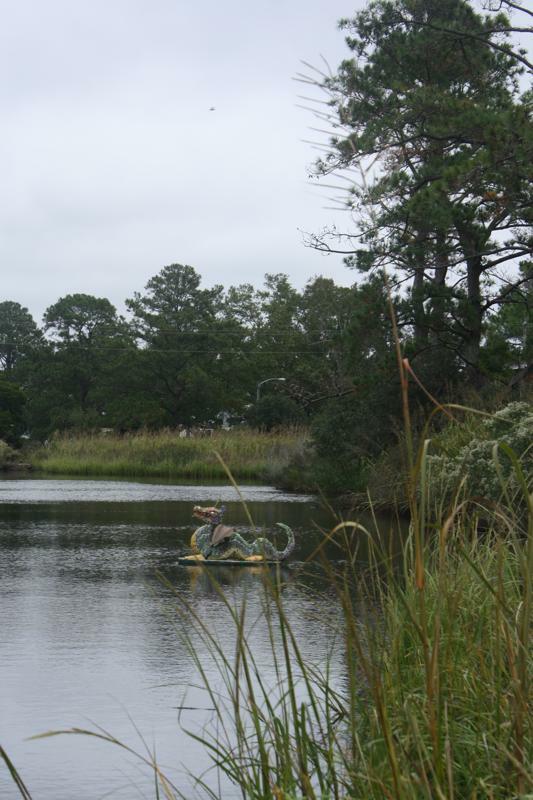 We even caught a glimpse of a juvenile dragon in its natural habitat! We spent several evenings getting well acquainted with our dock neighbors, Phil and Lorraine (s/v Changes). Brian and Phil swapped racing stories. Lorraine shared excellent recipes and iPad apps. We’ll look forward to seeing s/v Changes again down in the Bahamas. Thanks, Lorraine, for sharing the group photo! Finally, although the clouds remained, the rain had stopped. We had a great window of opportunity for a little overnight trip down to Wilmintgon, NC….and we were off! 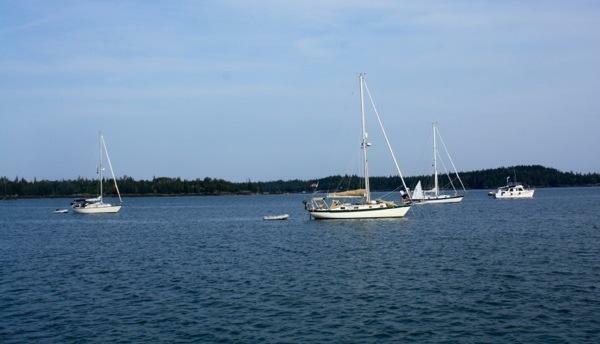 Brian and I had a fantastic sail on a reach from Camden into the Fox Island Thorofare. We sailed all the way into Kent Cove, North Haven and dropped the hook among the OCC boats that were slowly filling the cove. Once we’d all settled the group reconvened for cocktails aboard the rafted boats s/v Caduceus, s/v Anastasia, and s/v Sweet Dreams. 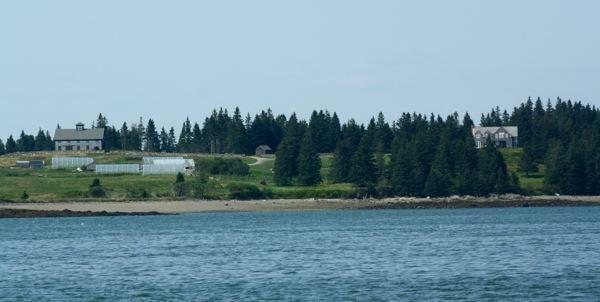 Brian and I have had lovely views of Turner Farm from Rode Trip on many occasions while passing through the Fox Island Thorofare. On this day we’d have the opportunity to tour the farm with the OCC. Just how many dinghies can fit on that haul out line? Turner Farm is MOFGA (Maine Organic Farmers and Gardeners Association) certified for their produce, flowers, poultry, and eggs. 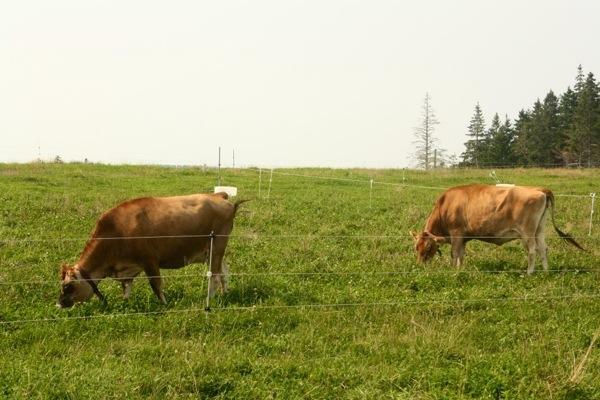 Turner Farm also farms pasture raised beef and pork and operates a creamery specializing in pasture raised goat cheeses. Turner Farm contributes to the North Haven Community School Lunch Program (the smallest public school in Maine with 70 K-12 students). 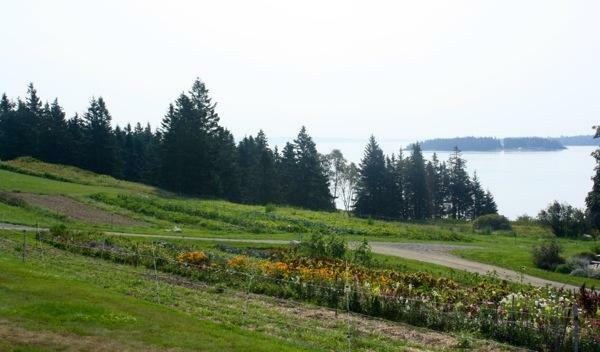 The farm also supplies produce, meat, eggs, and flowers to the Nebo Lodge, a Bed & Breakfast on North Haven. 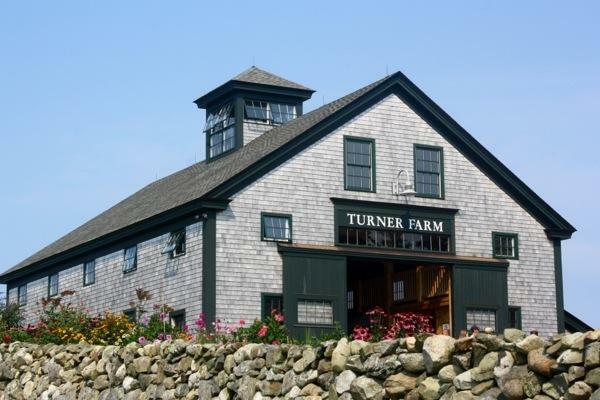 Turner Farm has an extensive history on North Haven. 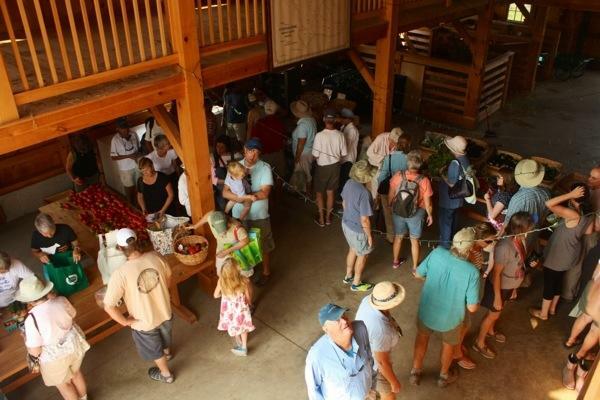 The farm stand is bustling during busy summer months; July/August Tuesdays and Thursdays 10am-1pm. 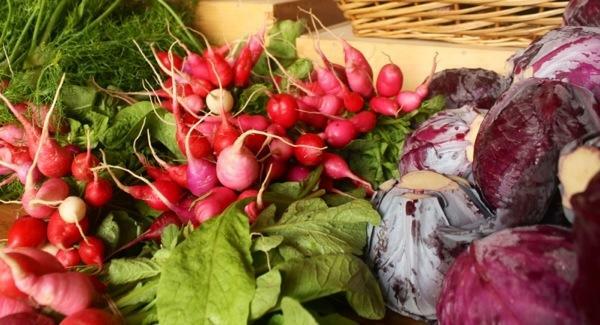 Farm products may also be found on neighboring Vinalhaven at the Farmers Market and at Island Spirits or on the mainland at the Wine Seller in Rockland. Arrive early to get goat cheese, it sells out fast! Farm managers, James and Brenna, took the OCC’ers on a fabulous tour of the farm. Brian and I were in James’ group; he did an excellent job of showing us the inter-workings of the farm and sharing future projects. James brings lots of energy and creativity to his work. These greenhouses are movable; they can be relocated over the beds throughout the season as crops are begun and continue to progress. 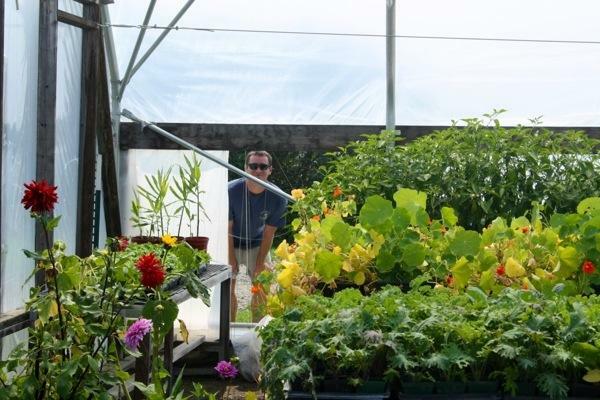 The greenhouses aid in crop rotation and sprouting. Turner Farm recently installed three permanent greenhouses that will enable them to produce late summer crops earlier in the spring. 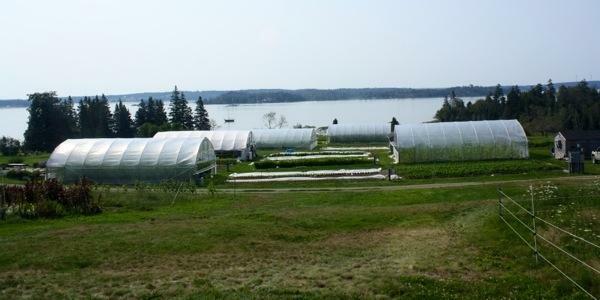 These greenhouses will be heated by a wood-fired furnace fed with spruce lumber that has been cut on the property. 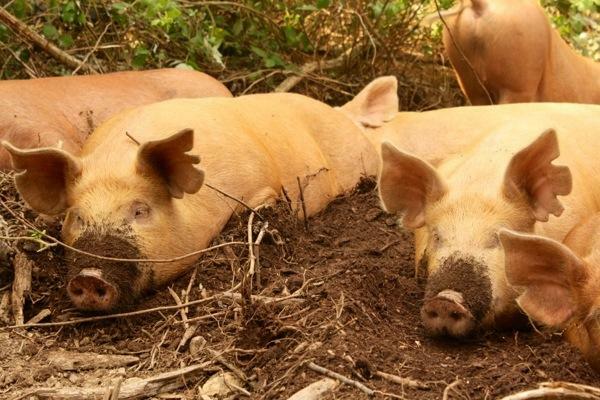 Tamworth Pigs; they look cute now, but after living a luxurious life roaming their wooded pastures these pigs will be hearty and delicious! 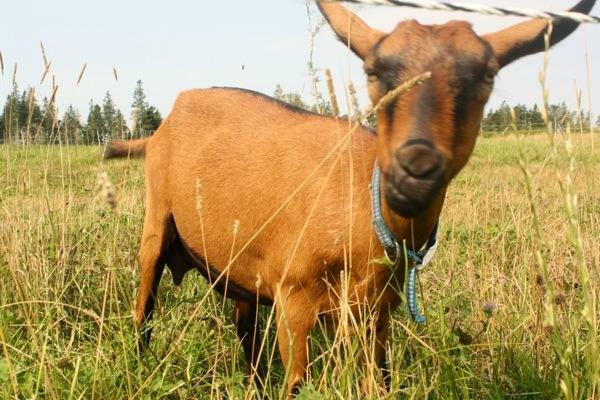 Oberhasli Goats; their milk produces chèvre and other goat cheeses at Turner Farm Creamery. Jersey Cows; soon to add to the creamery. Thanks to Turner Farm for a fabulous day!